The Coffee Beanery opened its first stores in the United States in 1976, before the American public knew the term "specialty coffee." In the 24 years that have followed, the Coffee Beanery continues to build its brand and franchise organization on the principles of time-tested and honored traditions and values. Exceptional coffee, a warm relaxing environment, and a corporate culture that embraces its franchisees with every opportunity to succeed exemplify these values. Today, the Coffee Beanery has over 200 locations throughout the U.S. and is recognized as an industry leader for its unique family business approach, corporate culture and commitment to quality. Single Unit - The Coffee Beanery's single unit license grants an individual or entity the right to own and operate an individual Coffee Beanery in an approved business location. Area Development - The Coffee Beanery's area development license grants an individual or entity the right to own and operate multiple Coffee Beanery locations with exclusive development rights in a specific territory. Area Franchising - An area franchise license grants an individual or entity the right to assist The Coffee Beanery headquarters in developing a specific exclusive territory. Area franchising would allow an individual or entity the right to provide hands-on support in recruiting new franchisees, securing new locations, coordinating the store development process and providing local training and pre-opening support to new franchisees. On an ongoing basis, area franchisees would remain available to support local franchisees and receive a portion of the total franchise fees and royalties collected in their territories. Area franchisees would own and operate their own single unit franchise and have adequate capital and resources available to fulfill their responsibilities as area franchisees. Although The Coffee Beanery currently does not include area franchising in our portfolio, this is an opportunity that we would consider should the right conditions exist. The Coffee Beanery has grown from a domestic to an international specialty coffee company through the implementation of a master franchise program that has fueled the development of our global distribution system. Master Franchisee - A master franchisee acquires the right to develop Coffee Beanery stores in a particular country with the training, guidance and support of Coffee Beanery Headquarters. Master franchise fees vary and are based on the size of the territory, projected number of Coffee Beanery centers to be developed and the quality of the opportunity. The Coffee Beanery system is a flexible one that can be modified to meet cultural, economic and sociological differences from country to country. 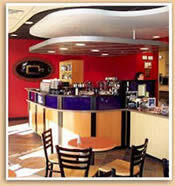 At The Coffee Beanery, we understand the importance of a good relationship between franchisor and franchisee. We also know that finding the right franchise can be difficult, so we've developed a simple process to help make your exploration a little easier. This franchise is not currently accepting inquiries.